New series by Amanda S. Jones takes travellers on a taste of all senses. TORONTO – April 30, 2013 – Step aboard the Aqua as it sails from Venice to the Greek islands and immerse yourself in true love, exotic locations, seduction and sumptuous foods. Ever since she’s grappled with the decision of a mastectomy as a preventative measure, tough-minded professor, Casey Trevitter, yearns for a gentle man. Ever since his mother died, workaholic businessman, Harry Ferro, longs to start over again and explore his creative side. After a passionate encounter in Venice, Casey and Harry meet again on the cruise ship, Aqua. Love happens on The Aqua. The Aqua series, an intimate experience of food, travel and love. In each book, you will journey on the cruise ship Aqua, each story bringing new characters, destinations and experiences, each interwoven with the last. You will also spend time in Chef Amber’s kitchen, at her food workshops or her chef’s table for a sensual and sumptuous food experience – taste the meals, test her methods in your own kitchen or even try some of the character’s moves in your own bedroom! 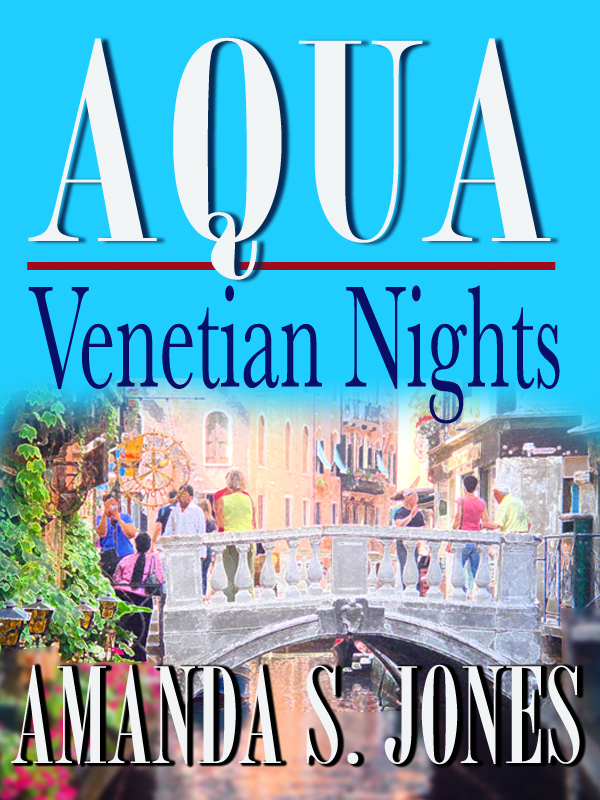 Venetian Nights is the first book in the Aqua series. Step aboard and see what’s in store for Casey and Harry. Readers can download Aqua-Ventian Nights from Amazon’s Kindle store for $2.99. Romance author Amanda S. Jones, loves travel, chocolate and red wine. You’ll find all of these elements in the books she writes! If you’re interested in updates on Amanda and her book series, sign up for the Aqua Club newsletter!